French Toast Alert Level: 1 Slice / Low. Explanation. 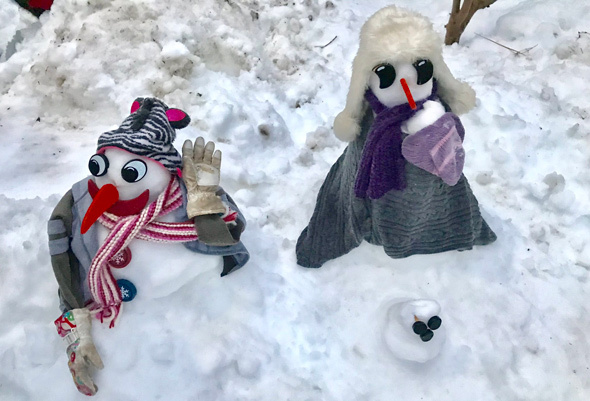 Jessica Burko reports her kids made these snowpeople today with a kit her mother-in-law gave them for Christmas and that the eyes are freaking her out and making her wonder what sort of evil creatures her kids have loosed on the neighborhood. 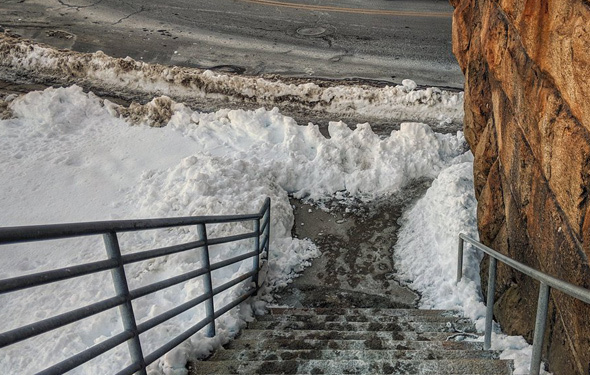 Jake could only marvel at the amazing shoveling job done by separate Keolis and DCR crews at the steps down from Readville station to the sidewalk below: One cleared the stairs and another cleared a path along the sidewalk and yet, somehow, neither thought to make it so pedestrians could actually get from one to the other. Keolis did promise to send down a crew to finish the job. Amy Hunt took this photo at St. Botolph and West Newton streets on Tuesday afternoon. 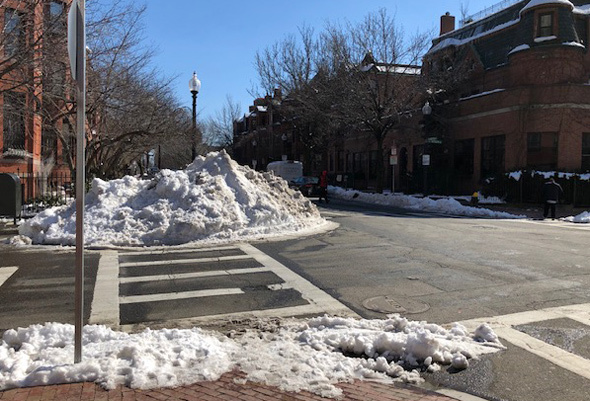 Note that the roadway is well plowed - in part by piling up all that snow right at the corner, right where the handicap ramp is - the handicap ramp that Hunt, who uses a wheelchair to get around in, can no longer see, let alone use. Read more. 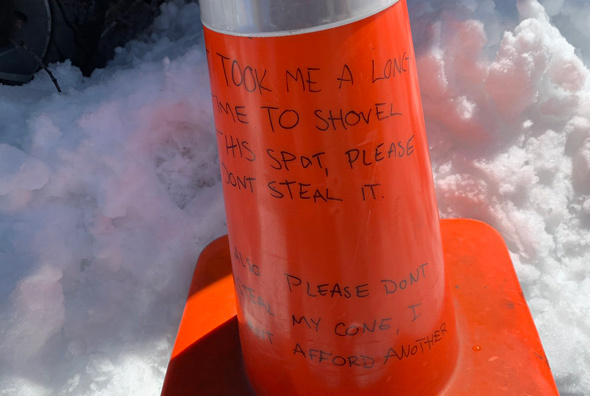 Shamus Moynihan ran across (but not over) this message-bearing cone in Allston today. 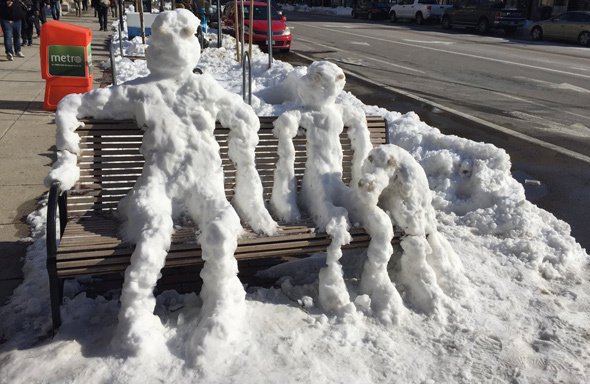 Tracy Strauss ran across these folks in Central Square today. Ed Ryan captured somebody fitting in: Read more. 24hrs after storm, someone shoveled out their car, dumped everything on the sidewalk, then put out a space saver. Either this person is a complete jerk or this is a political art installation commenting on the broken nature of Boston transit priorities. Have a seat! Space savers in Brighton. 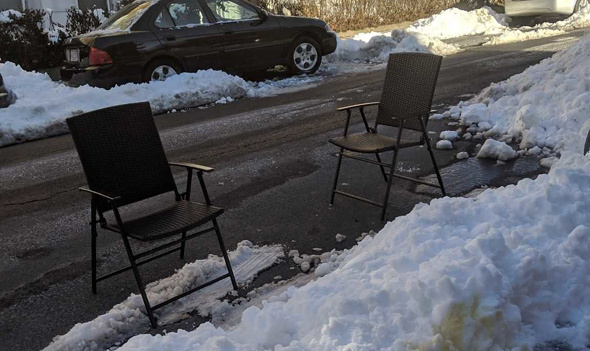 An irate citizen filed a 311 complaint from Charlestown yesterday: Read more. Yesterday, State Police went on social media to urge motorists to clear the snow off their roofs before getting on the road. 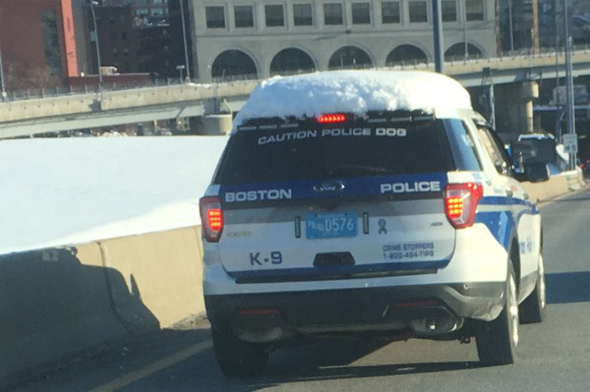 Looks like word didn't filter into Boston: EmbraceTheBald spotted this BPD vehicle on the Expressway this morning. 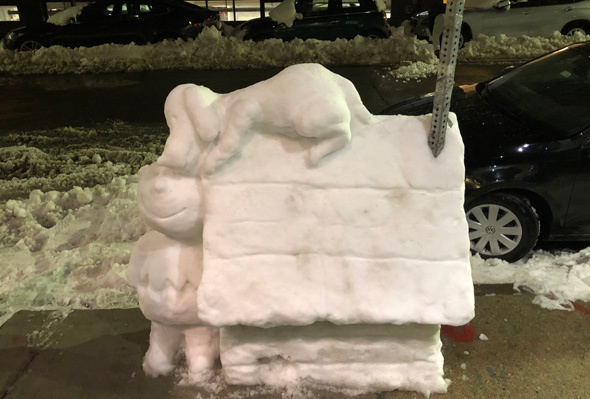 The Leather District dad who in winters past has built a snow Batman and a snow Darth Vader turned to the work of Charles Schulz for inspiration today, as Mike McD. shows us. 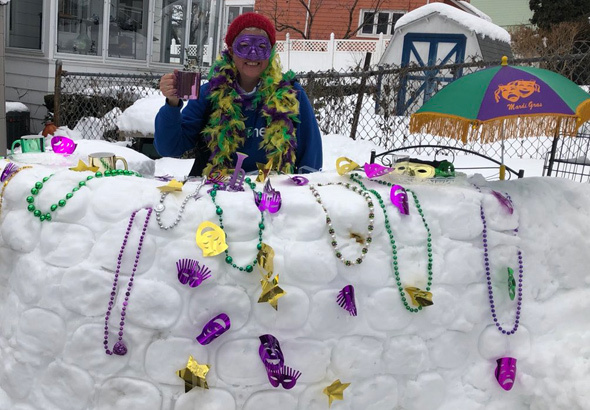 And when life gives you snow during Mardi Gras, make a Mardi Gras snow bar, as Kim Foley MacKinnon of Roslindale shows us. 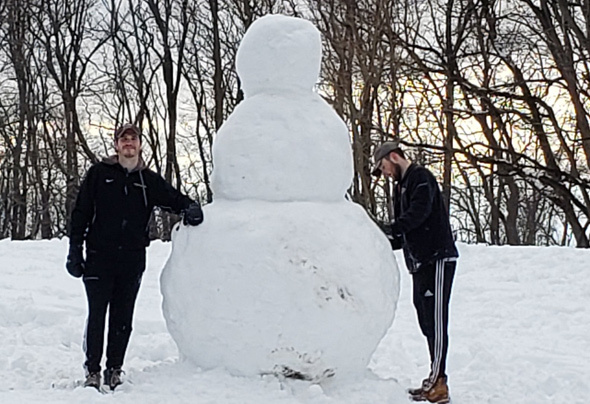 Bob Shaffer spotted these two guys and their big boi on Mission Hill today; reports they told him it only took them 45 minutes. 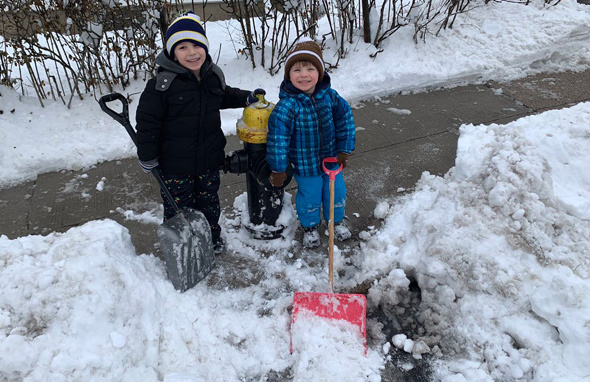 The Boston Fire Department is thanking James and Joshua, two Roslindale kids who shoveled out one of the city's roughly 13,000 hydrants today. 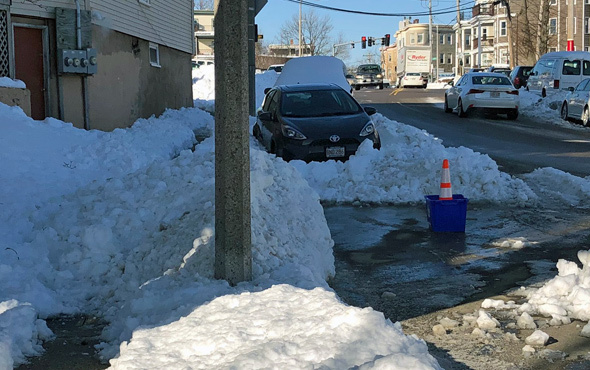 Meanwhile, City Councilor Matt O'Malley is once again giving out JP Licks gift certificates to any kids who tag him (or whose parents tag him) with a photo of them shoveling out a Boston hydrant. 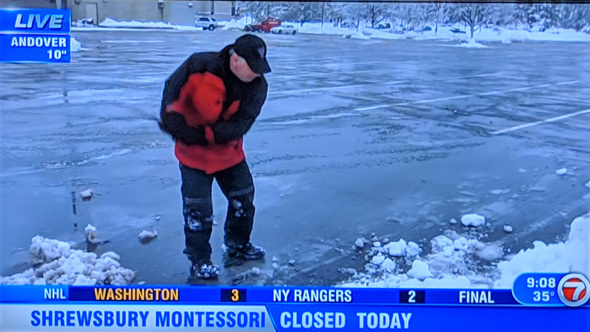 Shortly after 9 a.m. WHDH's Steve Cooper visually summed up his entire morning: He pointed to snow, shoveled some of it as he stood atop a snow mound, took some snow out of the shovel, made a snowball and tossed it at the camera, then swung the shovel to toss the rest of his snow, got off the snow mound, showed us Scooper, the snowman he'd built (with the help of a viewer who brought a carrot for his nose) and then got out a golf ball and club and a tee, and hit the ball as he yelled "FORE!" into an empty parking lot. But Boston community centers remain open, the city announced this morning. 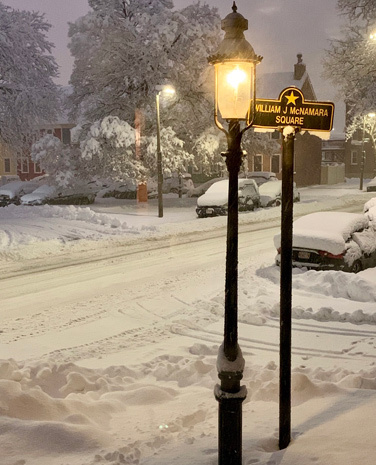 Gary Waldeck shows us Charlestown in the snow, shortly before 6 a.m. Pretty in the South End, as well: Read more. 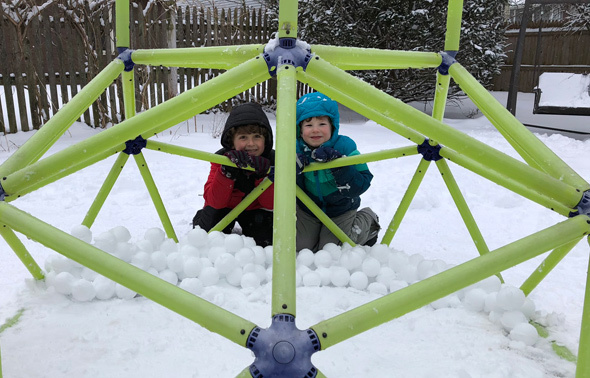 ScaryHiggy shows Charlie and Eli, both 5, who have built up enough stocks to have a classic snowball fight in West Roxbury. 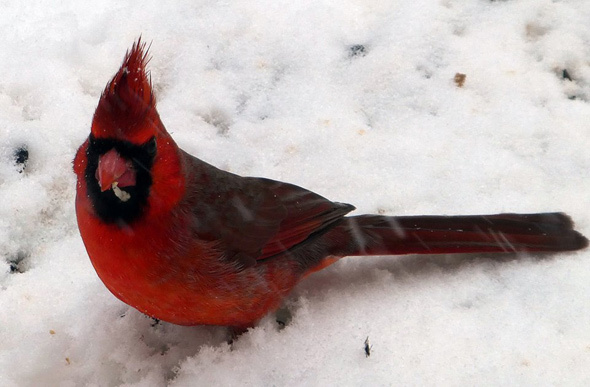 Mike Ball spotted a splash of red amidst the white and gray today, near his bird feeder outside his home in Hyde Park. Petra didn't see any cardinals when she looked out over Revere Beach today: Read more. In Danehy Park. WBZ talked to the MIT engineer who built it. 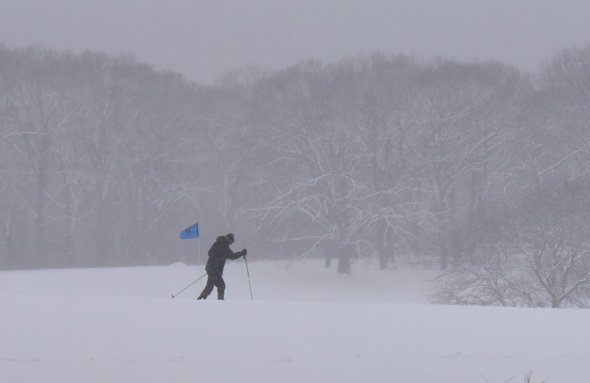 Jim the roving UHub photographer spotted a cross-country skier "playing through" the 4th hole at the William Devine Golf Course in Franklin Park around 2:30 p.m. today. But after the sun went down, Laura Castañón reports, the coyotes came out: Read more.